17 inch Electric Automatic Floor Scrubber - Buy the Trusted Clean Dura 17 Today & Save! 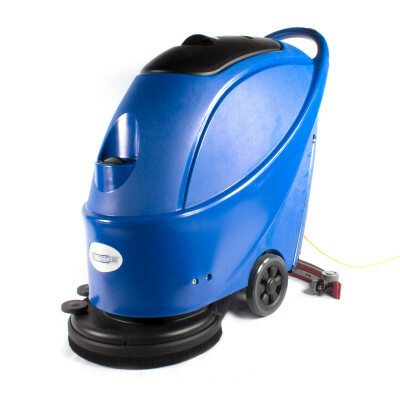 The Trusted Clean 'Dura 17' is a 17 inch electric auto scrubber that brings performance and value together. With its compact design and easy-to-use controls, this automatic floor scrubber allows you to deliver clean, sanitary floors in record time - even in cramped spaces! Created for any user, this scrubber gives you the best that auto scrubbers have to offer along with simplicity and durability. The 65' safety yellow power cord ensures unlimited run time. If you have access to a standard 120 volt outlet, you can run. Your controls are conveniently located right at your fingertips, and the practical operation of this scrubber makes learning to use it a snap. Trusted Clean equipment combines great features, durability and affordability. This electric auto scrubber is no exception! When used in conjunction with the right floor solution and floor pad for the job, this great little floor scrubber can be used to clean any flooring surface. If cords are not conducive to the space or layout of the area you're working in, we have plenty of battery-operated choices as well. For a battery powered model that features the versatility of extended run times and has a larger cleaning path than this unit, please take at its big brother, the 'Dura 20B' auto scrubber. For even more options, please feel free to check out our full of automatic walk behind scrubbers. If you're unsure as to which model sill fit your needs, please give one of our cleaning experts a call at 888-722-5508, and we'll be able to recommend a unit that will fit your specific needs. If you're looking for one click buying to purchase this machine plus all of its accessories, please take a look at our Dura 17 electric auto scrubber package. This package comes with everything you could possibly to need to scrub smooth and rough floors. It includes 5 cases of 17" red pads for smooth floor scrubbing, a 17" nylon brush for rough terrain scrubbing (think unfinished concrete), 5 cases of low foaming degreaser a case of defoamer (to increase your vacuum motor life), and of course the Trusted Clean Dura 17 electric auto scrubber that you see here. All in all, a terrific value as we throw in the 5 cases of pads for FREE! Comes standard with pad drive - just choose the right pad for your job and flooring type. Pad assisted drive lets you easily move the machine forward as you scrub. Low profile and compact design allow you to easily maneuver - even in close quarters. Customers who were interested in the Trusted Clean 'Dura 17' Electric Auto Scrubber w/ Pad Driver were also interested in the following items. Works semi-ok but not heavy duty enough for deep cleaning or any surface that is not smooth. Squeegee skips on rough concrete (ground 40 grit concrete) I wouldn't recommend to any contractor but probably ok for the once a week use. For the price it's ok if you need to clean your office, garage or small restaurant. Just not suitable for a contractor. Rolling side wheels are pretty cheesy as well as they are just hollow plastic wheels that didn't even spin out of the box. 3000 sq ft concrete shop floor cleaned in no time. No dust which was the main reason for purchasing floor scrubber. Good to use and simple. I really like it. it works very good thank you! It's a great peace only 1 problem it has few scratches it came with other wise it works very good thank you! This is a review for the Trusted Clean 'Dura 17' Electric Auto Scrubber w/ Pad Driver.